Cardiff City's discarded goalkeeper Neil Alexander says he is saddened by how negotiations went sour over a new contract to stay at Ninian Park. "We always knew that if Cardiff didn't come back with the contract that we agreed in January then we wouldn't be signing," said the Scotland stopper. Cardiff would not offer improved terms and eventually withdrew any contract. "I've got used to the fact now that I'm leaving, but I would have loved to have stayed," he told BBC Sport Wales. "It's part and parcel of football, but it's going to be a sad day when I drive away from Cardiff for the last time. "We couldn't agree a new contract, which was unfortunate, but I'll not be leaving with any grudges." 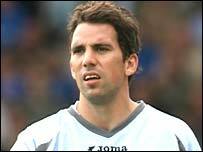 Alexander was brought to Cardiff in May 2001 from Scottish side Livingston for £200,000 by then Bluebirds boss Alan Cork. The 28-year-old has won three Scotland caps and has made more than 200 appearances for the south Wales club. Hearts are believed to be one club interested in taking Alexander back to Scotland, although English Championship trio Norwich, Ipswich and Sheffield Wednesday are also in the market for a goalkeeper. "I would never say 'never' about going back to Scotland but if I had the choice I'd like to stay in England for the next three of four years until I come to the end of my career," Alexander added. "I like playing in the English leagues, it's an excellent standard and there's quite a bit of interest from a few clubs. "I'd like to think I've got quite a good reputation; over the six years at Cardiff I've done well and established myself in the Scotland set-up and got capped." Alexander is sure that Cardiff are on the rise, especially with their new 30,000-seater stadium being given the final green light this week. "Unfortunately in the time I was here we couldn't get to the Premiership, but the squad has continued to get stronger, the new stadium and facilities are on their way, so it's only a matter of time," he said. Asked if current manager Dave Jones was the man to lead Cardiff into the top flight, Alexander replied: "Who knows? "Sometimes it's not always about the manager, sometimes it's all about the players. "We thought we had a good enough squad this year but maybe we just tipped it short."